Advanced level of CPR training for individuals who have a job-related "duty to respond" to emergencies. The 4 hour course includes an overview of body systems and medical/legal issues. Participants learn how to recognize and provide care in respiratory and cardiac emergencies for adults, children and infants, with special emphasis on two-rescuer CPR use of the resuscitation mask, bag-valve mask and Automated External Defibrillator. Techniques for minimizing the risk of disease transmission and for special resuscitation situations are included. This course is especially recommended for medical professionals, lifeguards, aerobics/fitness/sports instructors and public and private safety/security employees. This American Heart Association certificate is valid for 2 year. A written and practical test must be completed. 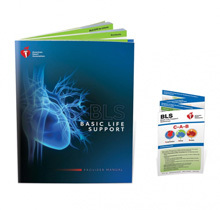 Students must pass a written exam and skills test in order to qualify for a BLS for Healthcare Provider Course Completion Card. Course length is approximately 4.5 hours.